Several neighborhood leaders and advocates have been working diligently over the past few weeks to find out what happened to kill the proposed “preferred alternative” project to slow traffic on 32 Ave. Yesterday, the Omaha World Herald reported the City will not do the project. The project involved creating a “complete street” in the corridor, including improved sidewalks and a two-way protected bike lane, among other improvements, while preserving parking. Studies from Omaha Public Works have shown that speeding is an issue in this area and improvements such as a protected bike lane will help slow the traffic and provide a safe environment for people on foot or bike. The preferred alternative also aligned with the goals of the 2007 Green Streets Plan and Environment and Transportation elements of the Master Plan. 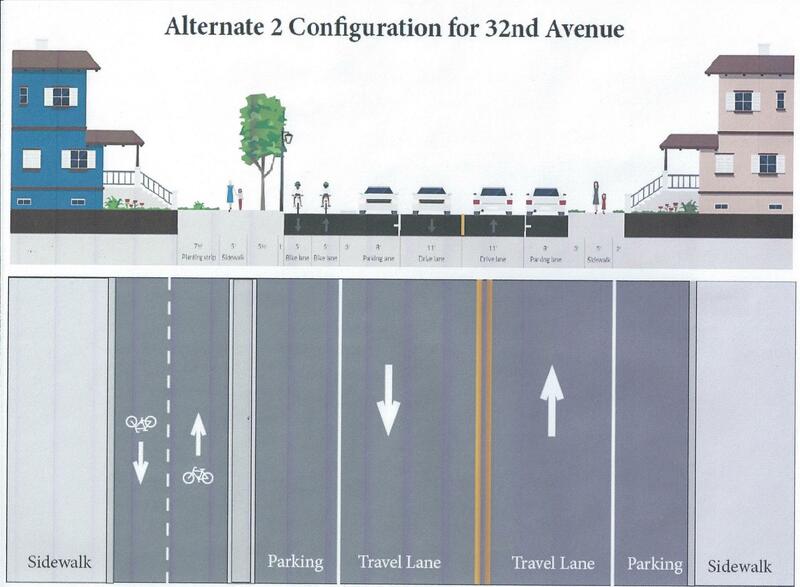 32nd Ave has also been identified as part of the already-funded 20 mile bike loop. There appeared to be general support for the proposed project by neighborhood residents and stakeholders. The South Omaha Neighborhood Association voted to support an intervention to slow traffic that included a protected bike lane at their meeting on November 7. At a public meeting on Nov. 20, to meet with Hanscom Park and Field Club residents, Public Works presented the preferred alternative but then told attendees the Nebraska Department of Roads (NDOR) determined that the amount of money that would have to be used to accommodate the environmental and historical issues in the neighborhood were too high to be considered a good use of federal funds. It should be noted here as well the funds were being provided through a Transportation Enhancement grant awarded in 2011. Transportation Enhancement funds are meant to expand travel choices and enhance the transportation experience by improving the cultural, historic, aesthetic and environmental aspects of our transportation infrastructure. Why this project was seen as a poor use of money given the funding source is unclear. The Nebraska state historic preservation office raised concerns this week that the two-way bike lane, protected from traffic by a median, would change the historic character of the street, a designated historic district….City Traffic Engineer Murthy Koti said it would be too expensive and take too long to address those concerns. Immediately after news of the November 20 public meeting was aired, people involved with historic preservation and restoration in Omaha raised questions about the information that the City reported at the meeting; specifically, that any historic designations in this area would apply to the street itself. Omaha Bikes documented several “modern” improvements along the curb line that do not necessarily align with historic principles. Information we’ve been able to gather through phone calls, meeting minutes, and emails gathered over the last few weeks show several breakdowns in communication, misunderstandings, and perhaps misinformation about the project. Among the many inconsistencies is that the issue cited for killing the project–Nebraska State Historic Preservation Office concerns–do not seem to be real concerns according to the Deputy State Historic Preservation Officer. At this point, it’s not clear why the project is being killed if the historical preservation issues cited are not issues and no other solution to resolving safety issues on the street have been proposed. The lack of information and transparency on this project has been very troubling. This project reveals much larger problems with transportation project implementation in Omaha. If using federal money (meant for transportation enhancements) causes this much confusion and wasted energy to get meaningful improvements on 32nd Avenue (improvements that the neighbors are asking for), how will anything ever get done anywhere in Omaha to make our streets safer for everyone? This project also reveals a highly problematic public engagement and communication process. This is not the first time such troubling issues have occurred—the Dundee streetscape redesign, S-curve redesign, and others have been equally problematic in the recent past. Something needs to be done to fix a broken process. We believe at this point the best way to determine what happened and how to find a solution to the safety issues on 32 Avenue is to bring decision makers together to discuss the project and process. We’ve asked the Metro Area Planning Agency, the forum for coordinating local planning and development activities, to call a meeting with Omaha Public Works, NDOR, Nebraska State Historical Preservation Office (SHPO), Federal Highway Administration (FHWA) and other key players to meet with neighborhood leaders and advocates to find a resolution to addressing the safety issues on 32 Ave. We also want to see better processes for engaging citizens and decision making from our city, state, and federal administrators. A little over half of TE funds from 1992 to 2010 went to bicycle/pedestrian projects throughout the state and about $19.4 million for 37 projects (out of 825 funded through the program since its inception) have come to the Omaha-metro area. http://www.enhancements.org/profile/NEprofile.php and personal email communication from NDOR, Sep. 2012.